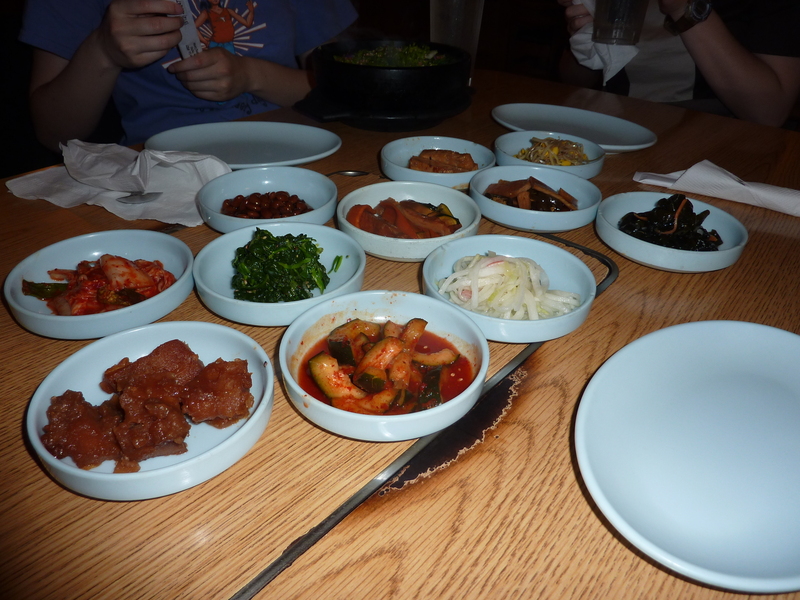 Of the Korean restaurants to try in Austin, it seems to be from hearsay and Yelp that Korea House is the place to go. It is also one of the few places in Austin that lets you grill your own meat. Eager to try someplace new and far from campus (sorry guys! ), we decided to try the place and see if it lived up to the rep. 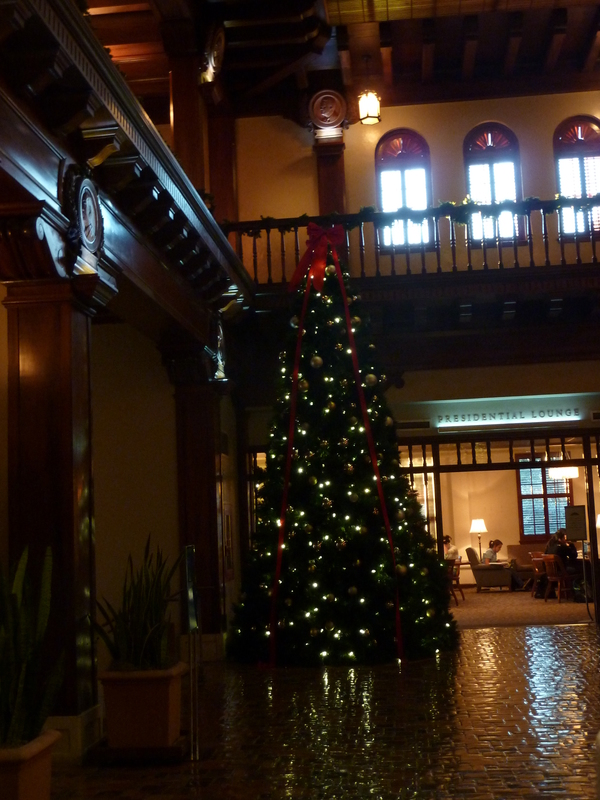 However, it was quite an adventure to find the menu or even the place! I can solve the menu problem for you by clicking here. I can solve the location problem for you if you read on. Whoa! There's a pond back here people! When we first arrived at the indicated location, we were very confused by where to go. The address is on Anderson Lane, but we could not find the place as we drove up and down the road. Apparently, you have to drive into the Village plaza with the Alamo Drafthouse and walk behind the first front of buildings like Madam Mam’s and Yumilicious. After you do so, you stumble upon a peaceful and lovely Asian garden where stands an alternative medicine campus and Korea House. See the hood and raw meats ready to be grilled? The nice thing about Korea House is that there is the option of both grill and regular. If you pick regular, just pick what you want off the menu like bibimbap, bul go gi, or even sushi. You get a regular individual meal with side dishes. However, if you feel like grilling your own food, you get put at a special table with grill and vent and you get to grill your own! Minimum of two orders of meat with side dishes. Just to let you know, only 3 side dishes are refilled. So we didn’t want to get too oily today so we decided not to go with the grill this time. We ordered individual dishes and ended up with dolsot bibimbaps and tempura udon. However, it did look delicious as you can see from the picture so maybe next time! I first became interested in trying dolsot (stone bowl) bibimbap after watching Mario Batali make it on Iron Chef America. He described the dish, emphasizing how the egg gave extra flavor while the browning rice gave an added dimension of crunchiness and taste. Tantalized by this description, it has been my goal since to try it. After tasting this dish, I definitely felt Mario Batali was right and I think you’d enjoy this if you liked bibimbap. If you don’t know what bibimbap is, here’s a website I like for descriptions as well as the official visitor’s site for Korea. But basically, bibimbap is a rice dish with lots of vegetables and sometimes meat that is placed on top of the rice in a bowl. You then mix it together with gochuchang sauce and sesame oil at your discretion to make a kind of mix-your-own fried rice. Weird description, but a little bit like what it is. 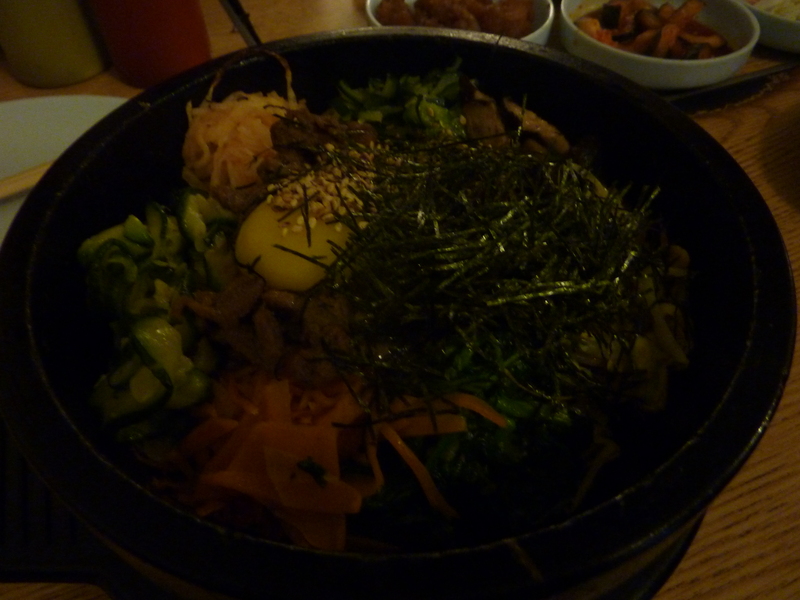 For the dolsot bibimbap, it came out in a heavy iron bowl and was SO hot! It cooked the egg and browned the rice on the bottom. I even had to cool the food down before I could put it in my mouth, it was so hot and fresh. That also made it important to mix up the bowl quickly. Give half a minute to let the rice brown, then mix it up so the rice doesn’t permanently stick to the bottom. Definitely put on the condiments they give you because it makes the food taste even better! Go easy on the red hot sauce (gochuchang) though. It was also a super big portion. If you’re starving, I’m sure the bowl would fill you up and if you have small appetites like us, it might be better to take some home or share with a friend. We were so full afterwards! 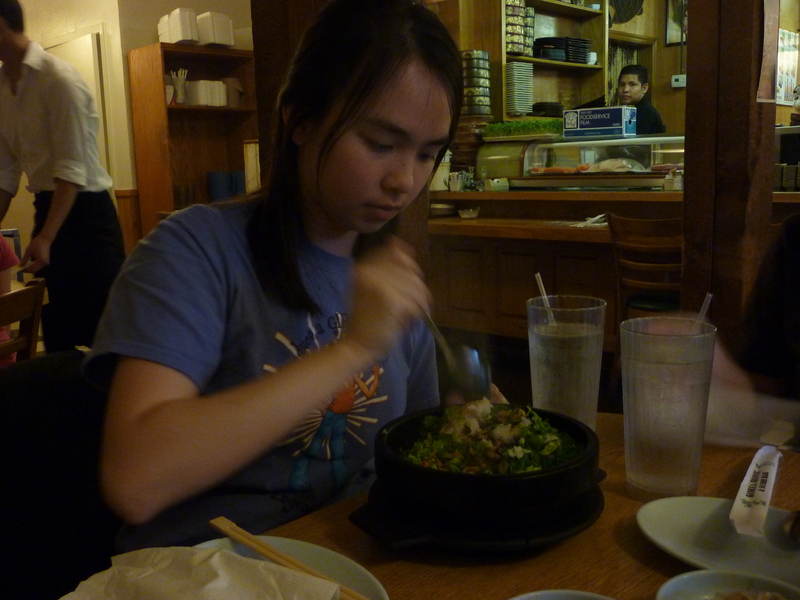 I definitely enjoyed my experience of dolsot bibimbap and if you like bibimbap, you need to try it in a stone bowl. For the tempura udon, it was deemed pretty good. 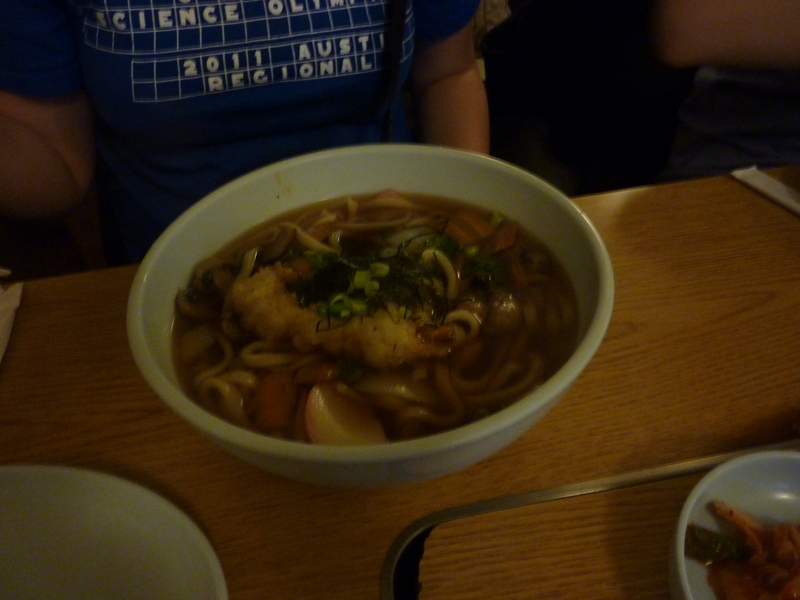 It was also a huge portion with tasty broth and noodles. Lots of veggies like daikon or Japanese turnip and broccoli. 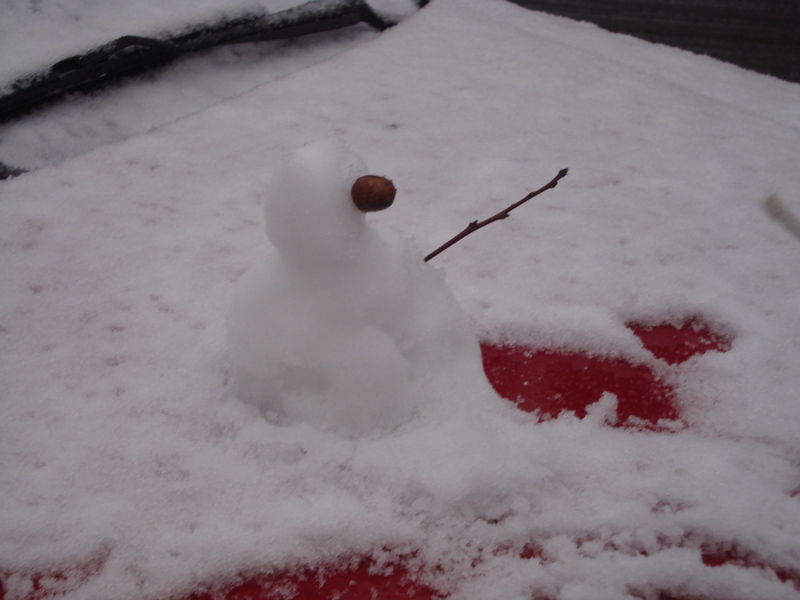 However, there was only one udon shrimp and he looked a little lonely. However, it was tasty and fair for the price (~$8). 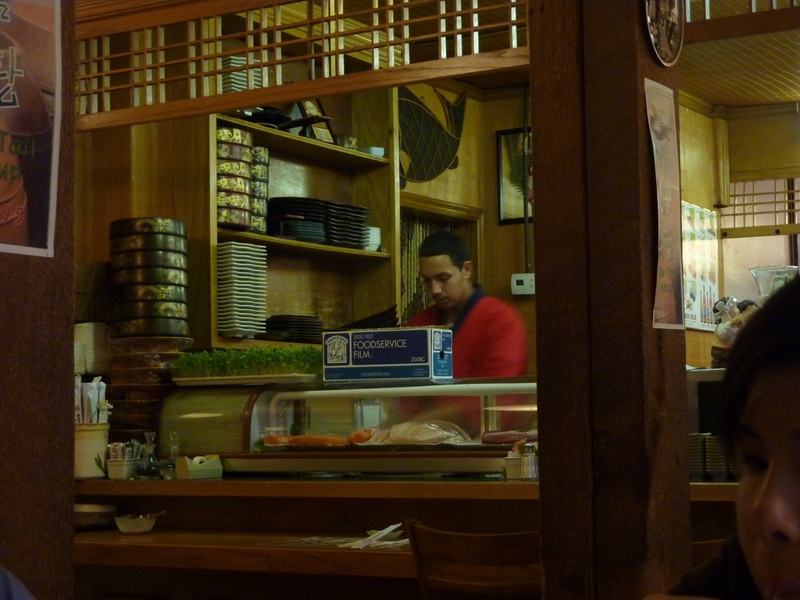 In terms of environment, there is obviously Korean touches, but there is more of a Japanese/pan-Asian feel to the place with a sushi bar right up front. There are LOTS of grilling tables, but be prepared for smelling like grilled meat when you leave. A little cramped, but more cozy than crowded with warm lighting and a relatively clean interior. 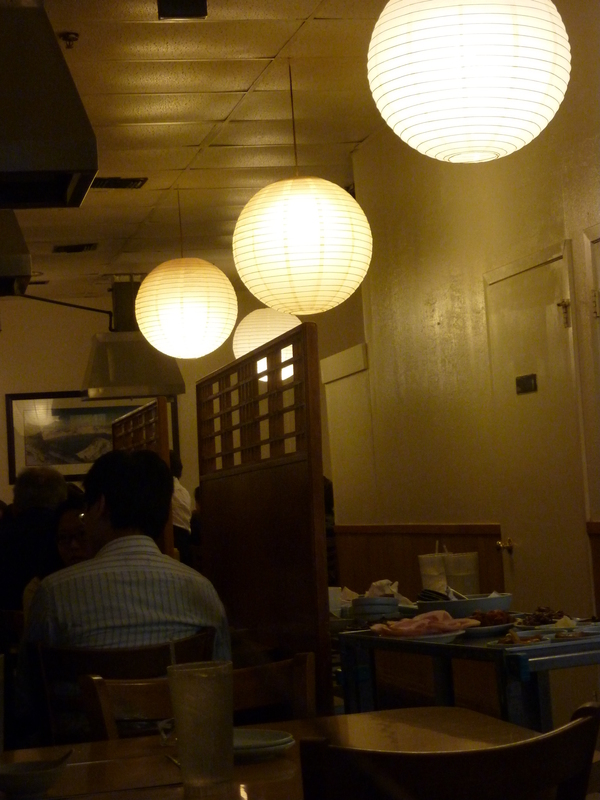 Overall, a nice place to go get Korean food and especially if you feel like grilling your own meat. However, it was a bit on the expensive side (avg. $13-$15), but at least you felt full and it was pretty good. Rating: 😛 😛 😛 😛 for self-grill, limited side dish refill, and variety. If you feel like getting some Korean food that you can’t get at the usual Austin places, come here! Sorry it’s been a while, but finals and general holiday preparations are keeping me busy. I thought I’d take a minute, though, and mention Austin’s growing reputation as a city for foodies. Yahoo! has been keeping busy by posting Top 10 places to eat in the US. Austin has recently appeared in two of them for up-and-coming restaurants as well as bakeries. First to be mentioned should be the GQ Eats: The 10 Best New Restaurants in America. Uchiko, a rather recent branch from the famed innovative Japanese restaurant Uchi, is featured in the article for its more Americanized version of Japanese food. 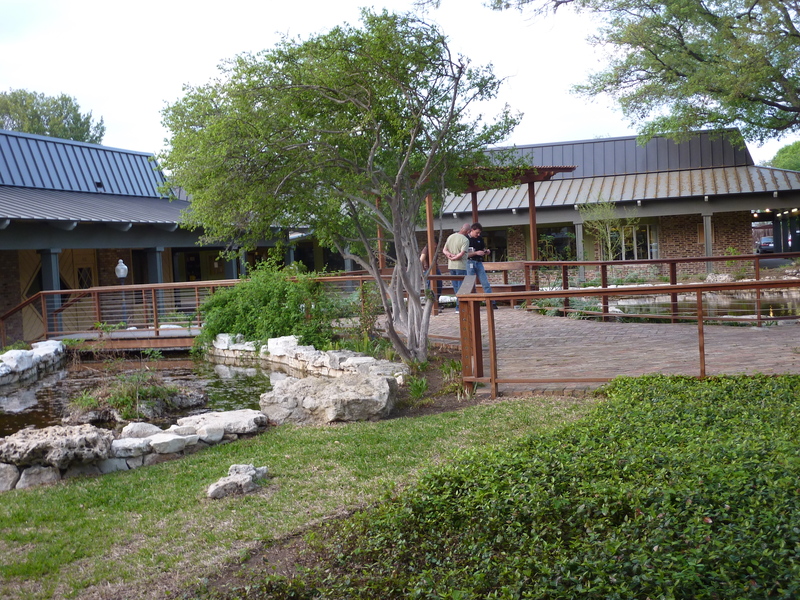 It has certainly taken Austin by storm and is quickly becoming as busy and popular as its parent Uchi. What makes Uchiko so unique is its allowance of its chefs to be more playful and creative with their creations that an established restaurant may not have the leeway for. Uchiko is a fine addition to the culinary range of Austin and it is obviously being recognized. For extra fun fact, Uchi is planning on extending itself to Houston for all you Houstinites in 2011 so if you’ve been enjoying your food in Austin, try it out in Houston too! Houston for Foodies! Next, from Bon Appétit’s 10 best bread bakeries, to be noticed is Barrie Cullinan, a well-established baker in Austin and featured quite a bit in articles that you can check out on her website here. Though she has yet to establish a baking site, one will be opening up this coming summer and her website allows you to order boxes just for yourself to enjoy tasty french pastries and delicious baked breads. Austin is moving up in the foodie world and hopefully you know that even if you are confined to campus, that doesn’t mean you can’t enjoy some delicious foods nearby or even ones made yourself. In case another article doesn’t crop up between now and the 25th, I wish you all a Merry Christmas and hope you enjoy yourself this holiday season with family, friends, and food!